It’s easy to see why you fell in love with the idea of adopting a Pomeranian. Distinguished by its vivacity, intelligence, extroversion, and fierce loyalty to its family, this tiny canine can make an excellent companion…for the right person. As with any breed, or dogs in general for that matter, it’s important for you to know what to expect when you take a Pom into your life. 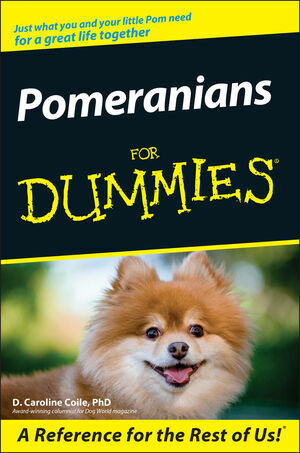 Illustrated with dozens of heart-melting photos of Poms in-action, Pomeranians For Dummies helps you to guarantee that you and your little buddy have a long, happy life together. D. Caroline Coile, PhD, has written 26 books and more than 300 articles about dogs. She has received numerous awards and has taught college classes in psychology and animal learning. Part I: Pomeranians: What’s Not to Love? Chapter 2: What’s in a Pom? Chapter 3: In Search of Your Soul Mate. Chapter 4: The Final Selection: Picking Your Perfect Partner. Part II: When Your House Becomes Your Pom’s Home. Chapter 5: Prepare to Be Pomerized! Chapter 7: Starting Off on the Right Paw: The First Few Days. Part III: Caring for Your Pom from Head to Paw. Chapter 8: Eating Out of the Pom of Your Hand. Chapter 9: Primping Your Pom. Chapter 10: Maintaining Your Pom’s Health and Happiness. Chapter 11: Doctoring Your Dog. Chapter 12: Traveling with a Pom Pilot (Or Leaving Him in Others’ Care). Part IV: Training Your Pom with TLC. Chapter 13: Saving the Carpets: Housetraining. Chapter 14: Mastering Manners and Basic Commands. Chapter 15: Dealing with Doggy Delinquents. Part V: The Part of Tens. Chapter 16: Ten Cool Activities to Do with Your Pom. Chapter 17: Ten Fun Facts about Poms.